The Honeycomb shibori pattern is pure magic! It is also quite simple to execute, making it a great beginner pattern. I will walk you through it with photos and step by step instructions, you got this! * Natural fiber textiles, meaning cotton, hemp, lenin, silk, bamboo, some rayon fabrics, I recommend Dharma Trading Company or supporting your local fabric store. You may want to wash the fabric first in the washing machine, to remove dust and sizing. 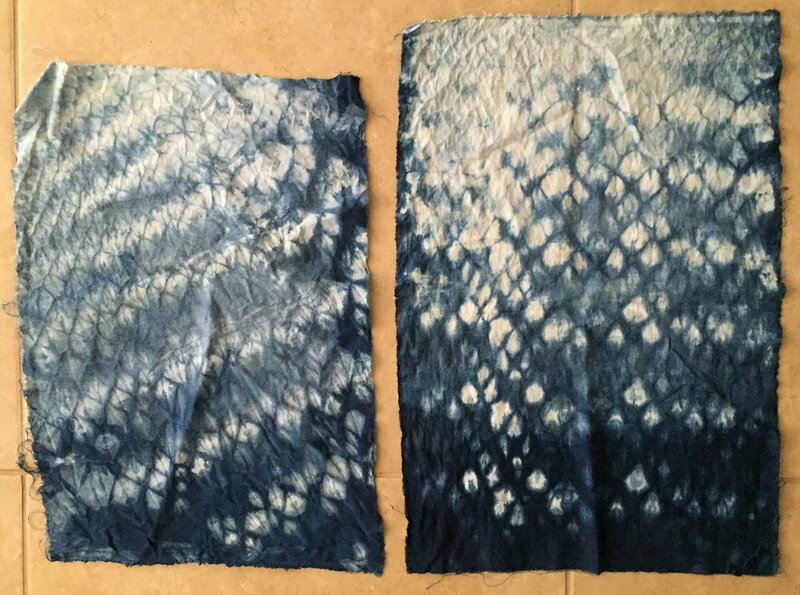 * Indigo dye kit from Jacquard which can be purchased on Amazon, Dharma Trading CO, or sometimes I find them at my local Arts Store, shout out to Artist&Craftsman! see photo above for a great photo. 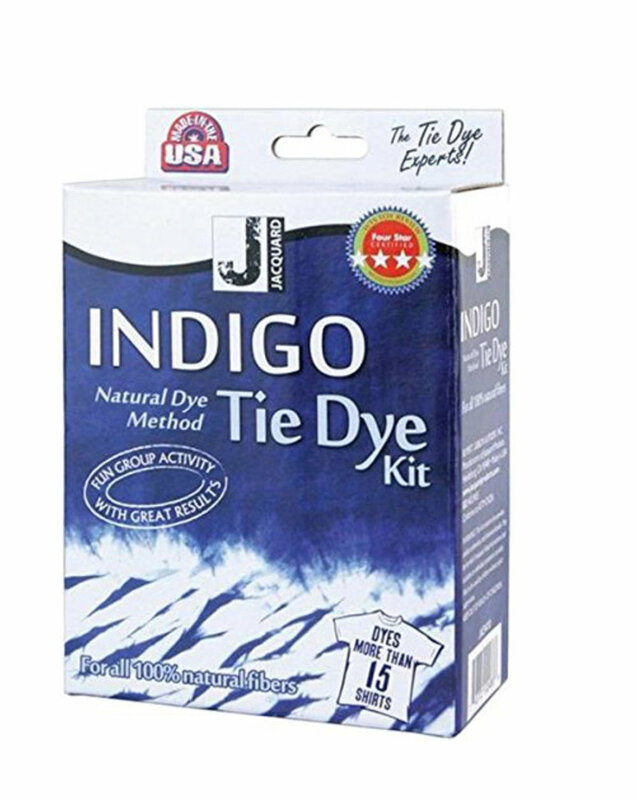 This kit contains a small starter pack for indigo dyeing designed for a 5 gallon dye vat. * You will also want a great pair of utility or dish gloves that you don't mind turning blue, some scissors, and depending on how many you make, different sizes of cord, rope, whatever you can find! 1. Make sure the rope is longer than the width of your fabric, I am making really small samples, the fabric can be really wide if you have long rope and strength to squash it down. 2. You can fold the fabric in half either direction, to make a mirrored effect of the pattern. Or you can try rolling the fabric diagonally on the rope. Or you can roll from end to end. The pattern will pretty much always make a blue color gradient with the lightest part of the pattern being on the inside, where you being rolling the fabric, and the darker part being on the outside. * Once the fabric has been rolled all the way up the rope, you will push the fabric on both ends of the rope until it is squashed together. This squashing/bunching action is what creates the honeycomb pattern on the rope. * When the fabric is pushed down tight on both sides (sometimes I have someone help me do this if there is lots of fabric rolled up) You will tie off the rope with a simple double knot, keeping everything in place, and you are ready to dye! * Note that there will be a little "tail" of the fabric sticking out at the end, this usually isn't too much of a problem because it adds to the ombre gradient created in the piece. If you feel like not enough was tucked in at the end, restart, every time you roll the fabric you will get better! * Indigo has a very unique dyeing process, because it is a natural dye, there is a chemical reaction involved with the oxygen in the air, which turns the fabric blue. You obtain darker richer shades of blue by continually dipping the fabric in the vat and letting it oxidize over time and then redipping. There are excellent instructions in the dye kit. 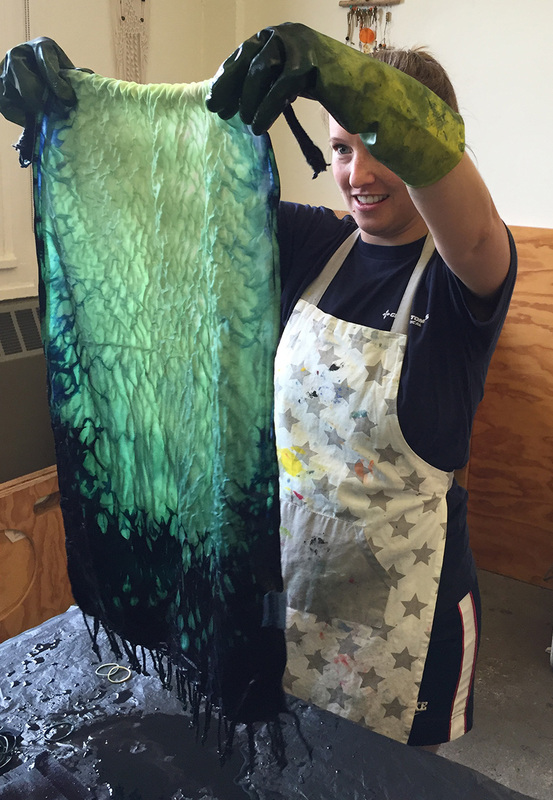 Keep in mind that it is possible to dye fabrics over several days, leaving your fabrics out and the dye vat covered. However, the dye will be strongest the first few days. * You might want to do this outside, on a patio, or in a local park. If you do this inside you will want to have lots of plastic sheeting underneath for stray splashes and drips that always happen. Also you might want some type of storage container to rest your piece in as it oxidizes, something to catch all the excess dye. * Now for the most exciting part! The unraveling! When you are sure you have dipped your fabric enough, you can unwind the fabric from the rope. * As you can see in the photos below, the fabric will be that light teal/greenish color that we started out with, this is normal! The oxygen hasn't been able to penetrate this part of the fabric, overtime the whole fabric will oxidize and the piece will change right before your eyes! * Keep in mind the white will stay white, the teal will turn lighter blue, the already oxidized blue will be the darkest part. 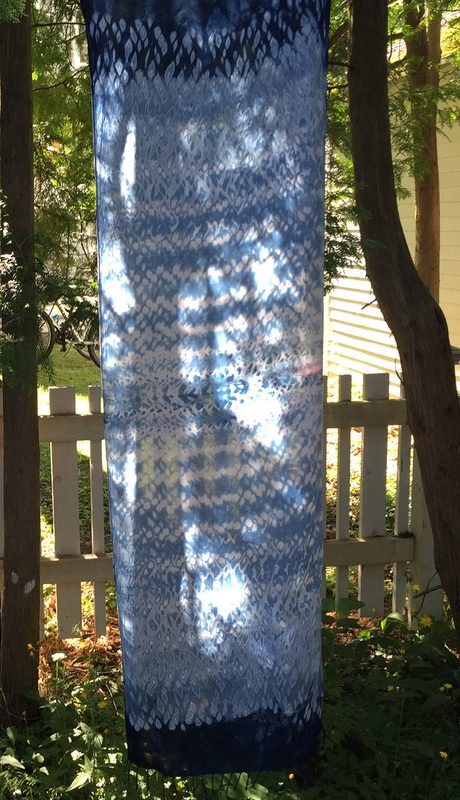 * Hang your fabric to oxidize and dry, when the whole piece is blue and white you can rinse the fabric in cool water until the water turns clean. Then you can hand wash with mild soap and more dye will come out again, wash and rinse until the water runs clear again, hang to dry and you are ready to wear your new garments or sew a new project!